Mid 13th-century St. Albans is crucially important in the history of English illuminated manuscripts thanks primarily to the works of Matthew Paris, a monk of the abbey. Many manuscripts have been--probably wrongly--attributed to the abbey by comparison with Matthew's style and technique; this psalter is therefore important because its claim to be a St. Albans product (based on the calendar, litany, and early ownership by a St. Albans monk) is secure. 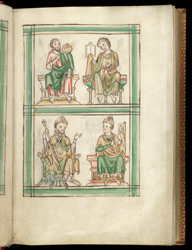 Usually saints are depicted with haloes, but the top left figure on this page, without a halo, is clearly St. John the Baptist, so all the other figures are probably also saints. The figure next to him is presumably St. John the Evangelist, almost always depicted as youthful. The figures below each wear a mitre, and according to medieval bishops, but neither wears a pallium, and they are thus not archbishops. Beyond this, their precise identification is uncertain.